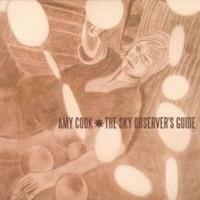 Written over the course of a month, Amy Cook's second album, The Sky Observer's Guide, is a strong albeit average album. Whereas Amy’s first album was just her and her guitar, this album showcases her band: Nina Singh on drums, Brad Rice on guitar and Bobby Daniel on bass. Cook's songs have been featured on many television dramas, including Dawson’s Creek, Veronica Mars, Laguna Beach and The L Word. Once learning this, I expected a cheerful, easy pop sound and was pleasantly surprised to get something entirely different. Cook's voice is reminiscent of a softer Jenny Lewis with echoes of Mazzy Star and much more melancholy than anticipated. The album is effectively smooth, and, although there are a few more upbeat songs, overall, it is a softer listen. My only disappointment was that there were few specific songs that really stuck with me. Most are more suitable as background music, which makes sense that her music has been used as such. However, the album finishes strong with my two favorites: “Pearl” and “Feathers To a Crown.” I was hooked particularly by the lines: “These are hard times for dreamers/We are just pennies in a wishing well/We ain't going to buy/We ain't going to sell." Lyrics such as these show Cook’s potential to go beyond music used for a few temporary moments during a television scene, and into something deeper, more meaningful and, thus, permanent.